"Trapped in time, trapped in love." 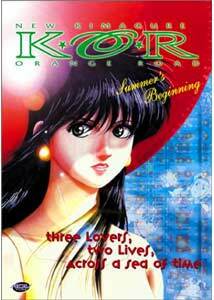 Summer's Beginning is a feature length, off-shoot of the long popular Japanese television show and comic book, Kigamure Orange Road. All of the Kigamure material has essentially been based around the same plot, which is telling the story of a young boy named Kyosuke and his trip through the trials of youth. Things are made more difficult than normal, however, due to the fact that Kyosuke has mysterious, telekinetic powers, as does his whole family. He also finds himself in a romantic dilemma, unable to choose between two girls he's interested in, Hikaru and Ayukawa. Kigamure Orange Road has found a cult-following amongst Western anime fans, and from what I understand, the series is highly respected in Japan. Summer's Beginning is another piece of the Kigamure saga and bases itself around Kyosuke's love triangle and some other unusual factors. Set in 1991, he, Ayukawa, and Hikaru are all preparing to move on to the their next step after school, presumably college. Kyosuke and Ayukawa are now an official 'couple', and Hikaru feels sort of like a third wheel, especially because of her awkward friendship with the couple. Things go strange when Kyosuke is hit by a car crossing the street. Afterwards, he finds himself waking up in another place, the place where he met Ayukawa to be precise, only it's 1994. He's been transported into the future, where he apparently has been missed greatly. He exists in an inter-dimensional state, and it also means that the Kyosuke of 1994 has been displaced somewhere as well. Although this strange, time-displacement plot provides the main thrust of Summer's Beginning, it is little more than a device to basically explore more problems of the romantic variety. While transported into the future, Kyosuke briefly entertains thoughts of an 'affair' with Hikaru, and this comprises a good bulk of what the film is about. Kyosuke's grandfather seems to know all the answers of how to solve this time-travel dilemma, but this isn't explained very well. Admittedly, I have almost zero previous experience with the Kigamure series, but there's still a pretty thin plot here. Mainly, we have the love triangle deal, and it's milked for pretty much all it's worth. The problem, at least for me, is that the romantic angle, and the comedy that ensues, isn't really very entertaining because it's extremely juvenile. Now, this isn't a flaw; obviously this is an anime made for adolescents and people for whom things like first kisses will induce fits of innocent giggles. It feels like something you might see in a kids soap opera, really. While there are fairly heavy sexual overtones, they're all done with sort of embarrassed, inexperienced quality, as you might expect for something aimed towards youngsters. It's cute, but failed to really hold my attention because it was so basic and bland. Anyone whose had any experience with similar anime (relationship/romance type like Ranma 1/2 or Sakura) will know pretty much what I'm talking about. Don't misinterpret this as toilet humor, because it's not that kind of thing; it's not that mature or 'dirty'. I actually saw a lot of potential in the whole time-travel angle, but nothing much ever comes of it. In fact, the plot relating to that is pretty confusing and rather ignored, which may have something to do with previous Kagemure movies. So, certainly this is not an anime for those seeking deep plots or heavy sci-fi. It's more of a light-hearted trip into the realm of teenage romance and the things that come along with it. It's tasteful, innocent, and charming, but ultimately for a certain kind of audience. In my opinion, one of the best anime series to pull of mixing romantic comedy with an actual, continuous plot is still the Tenchi Muyo series. Image Transfer Review: While Summer's Beginning looked a little older than it is, the transfer is pretty much the usual ADV one. There are no signs of digital inteference in the print itself, and other than some slight graininess, there are no real problems. Some portions of the film are diffused a bit, to add a dreamy quality, but this does not produce any problems. This is basically standard animation quality for ADV. Audio Transfer Review: The audio is fairly uneventful. While there is some music in stereo and a few sparse sound effects, the majority of the film is dialogue, all of which is easily understandable. There's a lot of directional dialogue, depending on the scene, but certainly no multi-channel madness. It fits the show, but doesn't go beyond it. Extras Review: Other than trailers (including the wild Original Dirty Pair), there are no supplements. The English dub of the film can, optionally, be accompanied with English subtitles for the few songs with lyrics in the films. If I had any major complaints, it would be that the film really needs way more than 8 chapter stops. There's undoubtedly anime fans more learned than I am who will really appreciate this movie, but I find it odd that ADV premieres Kagemure starting with this film, which is actually the third or fourth major feature in the series. I'd say it's worth a rental and an investigation, but if you're more into the fantasy/outer space dramas, this is definitely one to avoid.